The Institution of Public Private Partnerships has completed the Chinese translation of the Preparation Stage of the World Bank PPP Guide, a wonderful milestone! We are very delighted to see the APMG announcement of publishing chapters 2 to 5 of the World Bank PPP Guide in Chinese and the Preparation Examination on 3 December 2018. 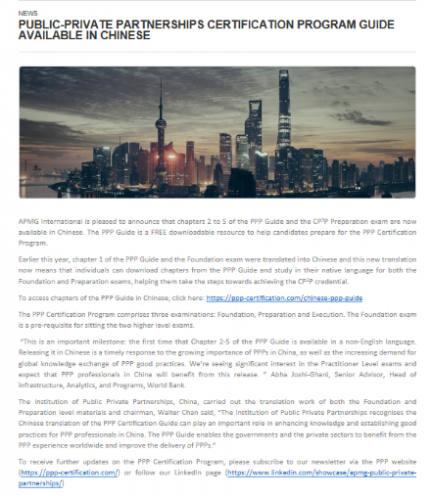 Earlier, this year, chapter 1 of the PPP Guide and the Foundation exam were translated into Chinese and this new translation now means that individuals can download chapters from the PPP Guide and study in their native language for both the Foundation and Preparation exams, helping them take the steps towards achieving the CP3P credential. The APMG PPP Certification Program is an innovation of the Asian Development Bank, the European Bank for Reconstruction and Development, the Inter-American Development Bank, the Islamic Development Bank, the Multilateral Investment Fund, the World Bank Group and part funded by the Public-Private Infrastructure Advisory Facility with a shared vision of enhancing PPP performance globally. “This is an important milestone: the first time that Chapter 2-5 of the PPP Guide is available in a non-English language. Releasing it in Chinese is a timely response to the growing importance of PPPs in China, as well as the increasing demand for global knowledge exchange of PPP good practices. We’re seeing significant interest in the Practitioner Level exams and expect that PPP professionals in China will benefit from this release.” Abha Joshi-Ghani, Senior Advisor, Head of infrastructure, Analytics, and Programs, World Bank. The Chinese translation of the PPP Certification Guide is the aggregate effort of the translation team from our Institution of Public Private Partnerships. We like to take this opportunity to thank our Chinese translation team for their dedication to the translation work. Especially, we like to mention our Ms Moon Wei who had been working day and night striving to complete the translation work in time. Our heartfelt thanks to Moon for all she does at the Institution of Private Public Partnerships. We are looking forward to complete the Execution Stage next year.